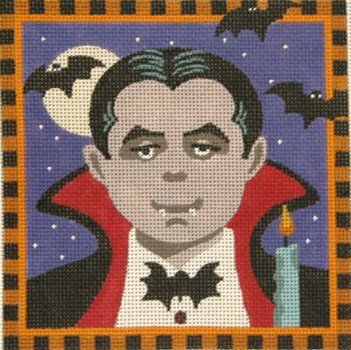 This Count Dracula Halloween needlepoint design is handpainted onto 18 mesh Mono Zweigart needlepoint canvas. The Count can be done alone, or as a set, made into a Candy Box. Choose from the Happy Witch, Young Frankenstein, Bride of Frankenstein, Pirate boy or Pirate Girl. If you need stretcher bars we recommend 2 sets of 9" bars and some thumb tacks. This Count Dracula needlepoint canvas usually ships within 7 days. If for some reason there is a delay we will let you know.